How has the month of January treated you so far? 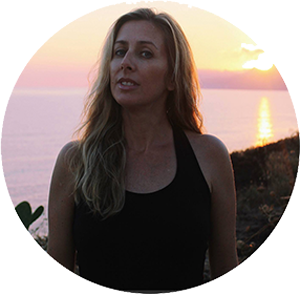 Are you on a 21 day detox after the holidays? 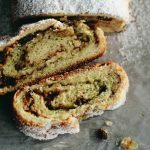 You have to leave room for one more indulgent treat and try this Pistachio Cream Nut Roll (Pane Dolce Uvetta, Noce e Cream di Pistacchio). This is seriously the real deal of sweet yeast breads. Not only is the dessert excellent on its own, but you have to throw in a layer of rich pistachio cream. I would not have made my own pistachio cream to make this. If our dear friend Davide who sells products imported from Italy hadn’t given us a trio of the creams by the Sicilian brand Fiasconara, this wouldn’t even be making it to the blog. The pistachio cream is made with Bronte pistachios that grow on the bottom of Mt. Etna in Sicily. Sicily is known for many products, but pistachios are one of its most famous. It was the week before Christmas, and my mother-in-law had just finished baking her famous Calabrian fig cookies. She makes enough for 50 people. So there were fig cookies every where and even though she was chastising me for making another sweet when we had her cookies to enjoy, I had to bake something myself. I bake Hungarian nut rolls every Christmas. 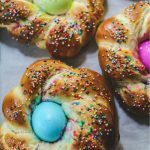 My mom’s Hungarian aunt used to make it for us when I was growing up, and Christmas just doesn’t seem the same without remembering her and one of the delicious sweets she used to make. 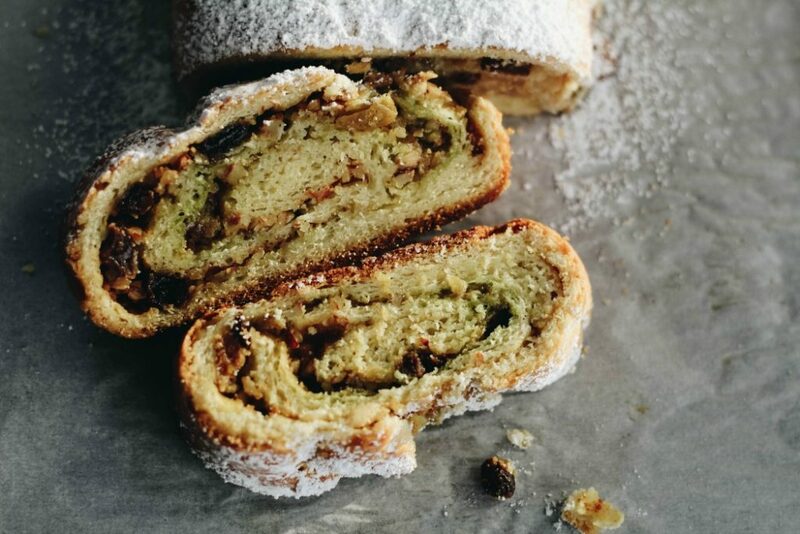 But this time it had a generous smear of pistachio cream before tossing on the walnut and raisin filling. The combination is beyond delicious! Think of pistachio cream almost like Nutella, but way better. Less sweet and more delicate. Davide gave us 3 creams. The other one was almond cream and the last one was manna cream. Manna is cultivated only in Sicily. The flavor is very subtle and sweet. The creams are delicious spread on every thing. I made some gluten-free sugar cookies, and it was delicious even spread on those. If you wanted to dabble in making your own pistachio cream, you could use this recipe. The one of left is with the pistachio cream. The center photo has the manna cream. 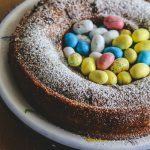 This is a dessert to make when you are stuck in the house on a snow day or when you really feel like you want to bake something with yeast. 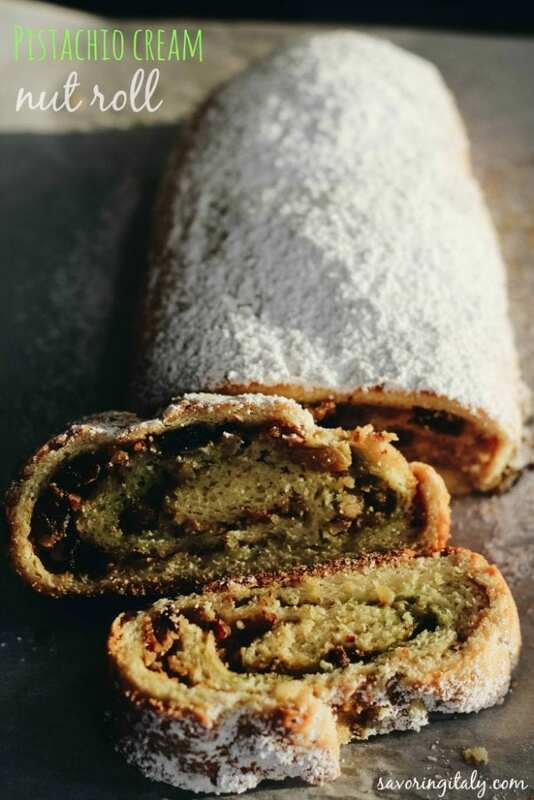 As I mentioned before, this is a nut roll you could make even without the pistachio cream. It is a dessert that is made with patience and lots of love. When every thing is so very rushed these days, I relax making my yeast breads and desserts. 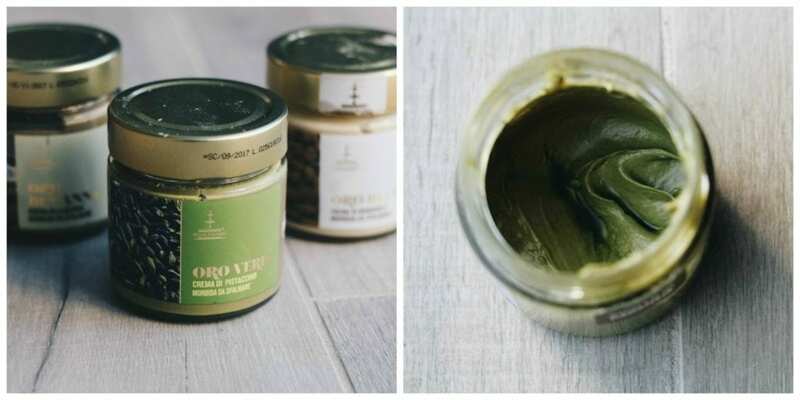 Now that I have tried it with pistachio cream, it would be hard to imagine it without! 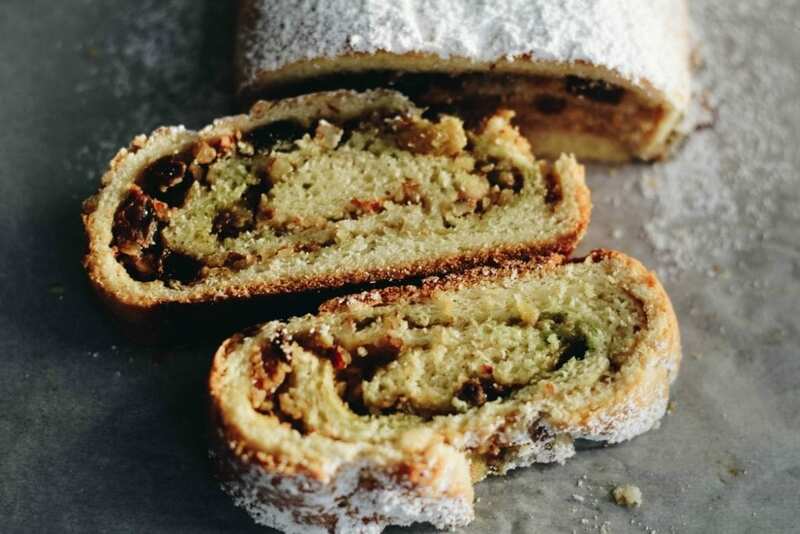 To save time on making the nut roll, you could make the filling ingredients the night before and leave it to rest in the refrigerator. I added a little bit of Nocciolino liqueur (a hazelnut liqueur) and if you can’t find that, you could use brandy or any other favorite liqueur you use for baking. You could skip the liqueur and use orange juice instead.I placed each roll on a separate baking sheet. If you have silpat mats, you could line the sheets with them. You could also line each pan with parchment paper and spread butter on them (or use an organic baking spray). 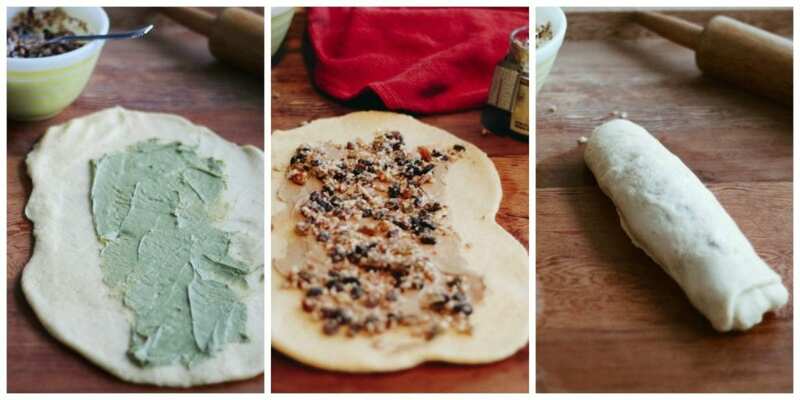 A delicious yeast bread filled with walnuts, raisins and a delicious Sicilian pistachio cream. A perfect dessert to make during the holidays or any time of the year. Heat the milk in a saucepan until lukewarm. Pour the milk into the bowl of a mixer. Add the yeast and 1/2 teaspoon of the sugar and let it become very foamy, about 10 minutes. Beat in the butter and the egg yolks one at a time until combined. Mix in the remaining 5 Tablespoons of sugar, lemon zest and sour cream and beat until combined. Slowly add in the flour one cup at a time. Mix together on medium-low speed stopping the machine to scrape down the sides of the bowl. Slowly add the rest of the flour and mix until combined. Stop the machine as you add each cup of the flour to scrape the sides of the bowl and incorporate the flour. Mix on low speed until dough is incorporated. Add flour if needed 1 Tablespoon at a time. The dough will be a little sticky but also firm. Form the dough into a ball and place into an oiled bowl (when I put the dough in the bowl I swish the dough around the bottom of the bowl and then flip it over so all of the dough is covered in a light film of vegetable oil). Cover with plastic wrap and let it rise at room temperature until doubled in size (about 1-1 1/2 hours). In a small bowl, mix together the walnuts, sugar, raisins, brandy and milk until combined; set aside. Preheat oven to 325 degrees. Divide the dough into 3 balls. On a floured surface, roll out the first ball into a 9-by-13-inch rectangle. Spread 1/3 of the walnut mixture evenly over it and roll it up into a 13-inch-long log. Dab some of the beaten egg white along the seam and place the log seam side down onto a well-buttered 9-by-13-inch pan. Repeat with the remaining dough. Cover and let rise for 45 minutes. Brush the whole beaten egg over the tops of the loaves. Bake until lightly browned, about 45 minutes. Transfer loaves to a wire rack to cool for 15 minutes. Dust with confectioner’s sugar. Slice and serve warm or at room temperature. 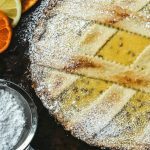 I love baking with yeast and will be trying this recipe as soon as my order of pistachio cream arrives. I have one question about the pan. You say to put the rolled up dough in a 9×13 pan to rise a second time. Is each roll in a separate pan or all three in the same pan. I know that sounds like I don't know how to bake, but that was not clear to me. 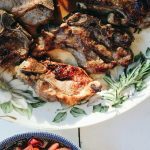 I am so looking forward to making this recipe. I need to head to the kitchen and get to baking! I just love pistachios! Can't wait to to whip this up! That filling!! And that cream!! OH mah goodness… Can't imagine just how good this is. Beautiful roll, Lora! Oh boy. I could totally eat the entire thing all on my own. It looks terrific. I've never had anything like this before but it looks wonderful!